The village Podhradie is joint of two villages – Podhradie and Konské. The terrier borders on terriers of villages Turčianska Štiavnička, Turany, Sklabinský Podzámok and Nolčov in the district Martin. It is situated on the foot of the Veľká Fatra (The Greater Fatra) and the highest point is Kľak – 1394m above sea level. The village midpoint is 470m above sea level. Through the villages and Podhradie and Konské crosses road of third class which connects our village with Nolčov and Krpeľany on one side and with Sučany and Martin on the other side and in addition to this you can go through Turčianska Štiavnička to Sklabinský Podzámok. The village counts 710 inhabitants (thereout 49 inhabitants in Konské). 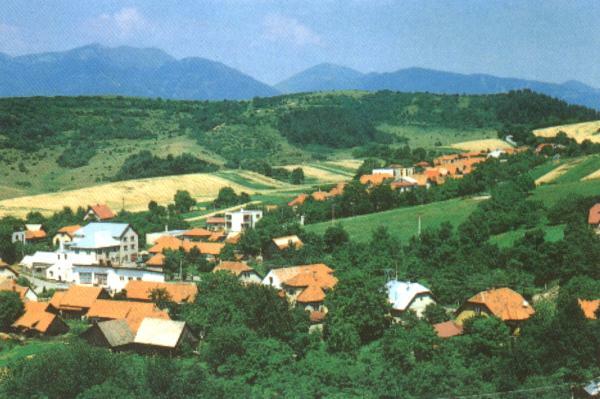 The first inscription about the village originates from the year 1321 where the village is mentioned as a community belonging to castle county on a hill above the village (ruin), further at Hrádok hill in the village there can be seen a basement of former guard castle with a beautiful view of the Isthmus of Strečno. In the terrier Konské should occur a fossil reminding of man footprint but this area is no more to be identified after some inadequate human interventions in the past. Across Sklabinský Podzámok, Turčianska Štiavnička, Podhradie, Konské, Nolčovo had passed a post way and in Konské had been a horse stage. The village Podhradie is interested in development of tourism. To the higher level of services belong a sports ground with a building, a ski-lift, a boarding-house (capacity 24 beds). For our inhabitants and for our guests is prepared a sauna and an all-purpose sports ground (tennis, volleyball). There are three folklore groups, children´s folklore group Hrádoček, maiden group Vajánok in the village. We consider tourist lanes as an attraction for visitors. You can come to a rock near Konské where were found some footprints of homo sapiens, to rock holes where does not freeze in the winter and where were living partisans during the war.